I want to change. The desire comes both from my need to move away from where I am, and to approach the places I as yet only sense. I know that that requires personal effort. And yet, there are opportune moments which lift us beyond ourselves. One of those comes in forty-year cycles. It is after forty years of journeying through the desert that the Jewish people are told, “G-d has given you a knowing heart, eyes with which to see and ears to hear.” On these words, the Talmud comments that after forty years, “A person attains the consciousness of his teacher.” One is then capable of accessing the inner essential intent of one’s teacher. Even of our ultimate Teacher – G-d.
I’m in South Africa and I’ve been studying a teaching of the Rebbe on the notion of forty years, on knowing hearts and becoming new. It was spoken that many years after the passing of the previous Rebbe. It’s awakened in me the ever present desire for movement and change, the existential dis-ease that propels me forward. I want that ‘knowing heart.’ So why is it that I constantly feel my feet dragging? I’m like the dreamer, swimming through mud as I race to nowhere. For all the desire to move, I am decidedly stuck. So I make my way to the home of Rabbi Kesselman, my teacher of twenty six years. “It’s always the same and always different” he reassures me. I want to understand this notion of ‘forty years.’ Forty years for a concept to enter the world or to enter my heart. But they don’t have to be passport years. Once the concept enters the world, my limitations don’t matter so much. That’s refreshing. We’re taught that if we apply effort, we will succeed. Life’s deceptive. I often feel the opposite – that I put in the effort and don’t see results. Then comes the notion that ‘forty years’ brings with it a new reality and just by virtue of a cosmic shift, I can become a new entity, on a new foundation! Yes, And once it enters, we are in a different reality. Things are forever different. Before the Rambam, people described G-d as having physical form. We’re not going in to how that was possible. They did. What they meant and how they meant it is for another time. Then came the Rambam and said it’s forbidden to talk of G-d as being ‘in a body.’ And from then onwards, it was heresy to frame reality in a way that had been permissible until that point. Before it wasn’t heresy. After the Rambam it was. Or take the notion of loving another person. The Torah tells us to love our fellow as ourselves. The Ramban says that’s impossible. Sure, we can behave lovingly to others, treat them as if we loved them as ourselves, take care of their possessions in the same way we care for our own. But self love is innate and love for another is acquired. So the Ramban says we can fulfill that verse through action but not in a deep, essential way. Then along comes the Baal Shem Tov. He says, ‘Love your fellow as yourself. For real. And love the learned and illiterate equally.’ That’s a new reality. The spiritual landscape is changed by what he says Or another way to look at it is that now he could say it because the reality had shifted.. Next comes the Maggid. He says, ‘Love a righteous person and one who is fully wicked equally.’ You see how the line in the sand is moved? It’s a new marker for a new reality. And then comes the Alter Rebbe. He tells us, ‘Making distinctions is irrelevant. One cannot make distinctions between learned or illiterate, righteous or wicked. Love indiscriminately’. Until each of these teachings came into the world, it wasn’t possible to love in the new way. The Ramban was right. Until the Besht. And the Baal Shem Tov was right. Until the Maggid. And he until the Alter Rebbe. We have a different relationship with G-dliness today. Until the Jews completed forty years of wandering in the desert, they couldn’t go in to the Land. It wasn’t possible. If the Jews had gone into the land before the forty years, they would have been swallowed up. The spies were wrong – but they were also right! Four decades on they could,enter – despite their own limitations. The same applies in every generation. 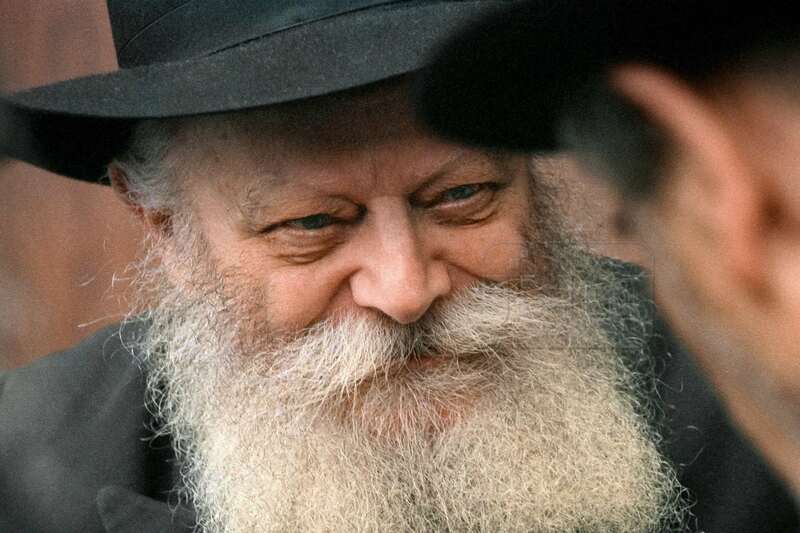 Now that forty years have gone by since the passing of the Rebbe Rayatz, his teachings, his vision, his being, can enter the world in a new way. Now you can ride on that wave. It’s bigger than you. You can enter the Land. It’s confusing to me. On the one hand, to put in so much effort and – at least apparently – not see results. And on the other, to know that a wave of awareness flows into reality, it’s got nothing to do with my personal worth or abilities, and boom! now I can enter…Just so? Of course you need to put in effort. You have to work. But don’t be too attached to what you personally can accomplish. Know that what’s really happening is going on beyond you. You’re attached to a Western notion of success, of spiritual process. Don’t get caught in the trap of self-actualization, of spiritual evolution. The desire for self-actualization is idolatrous. Don’t look for perfection. Not in yourself. This is not about being an A+ Jew! Look to the job at hand. We have to bring Mashiach. Look to serve. That will bring all the healing you need. We’re set up to fail. And to succeed. But the process is not clear – because if we’d openly succeed, we’d become robots. Do you understand that? You’d just be an animal instinctively reacting to success if you saw the fruits of your efforts each time you tried.. So you try and G-d gives you successes and at times He knocks you down. And you shift – but the confusion, that’s what really brings the change. You’re entitled to fail. One hundred percent. The calculations of the Holy One Blessed be He are not your business. You just have to do what you have to do. Now after forty years, our whole premise, the whole starting point is different. If before you were a servant, now be a child. As a child, your personal success or failure becomes irrelevant. Don’t be attached to the outcome. Do the work. We are midgets on the shoulders of giants. The animal soul will push you not to be where you are. And not to be who you are. So when it’s time to work, it’ll tell you to slack off. And the other way ‘round. It has everything to say when it should just be quiet. It has no business telling you whether to be an observer or just to be. I don’t mean that we have no work there. Obviously, there’s the shift from analyzing to deeply knowing from within. What I’m saying is that there’s something beyond even that. You might feel like an observer but you are one with G-d. Whether you are stuck in your head or in the flow, you are one with Him. Your spiritual service is to reveal that reality. ‘Forty years’ means you have something so deep within, you don’t even know you have it. But it’s there and it levels all the other manners of service. You have something within, your own work. And you have the forty years. Not any more than any one else. We’re all prime candidates for divorce. You believed just enough to be a vessel. All our situations are really the same deep down. And no matter how the problem manifests, the solution lies in realizing that we are one with G-d and that He loves us like an only child and that all our challenges are custom-made for our benefit. Recently I saw a JEM video where Nochum Kaplan related a story about a young girl. She suffered enormously and wrote of her pain to the Rebbe. He responded saying, ‘I feel your pain.’ She said, ‘I don’t believe you.’ Now the truth is, we all feel the way she did but we’re just not brave enough to articulate it. We don’t really get it that the Rebbe feels for every Jew. How did he respond? He said, ‘You will realize the truth of my words in a few years. You will marry and have a child. When you feel your baby’s pain at teething time then you will understand my pain for you.’ The Rebbe’s analogy broke through. She got it. What would it do for us if we knew it pained the Rebbe that we suffer. Experiencing the empathy and love. And what about G-d?! How would you wake up differently if you knew your Creator ached for you? Work to reveal this reality to yourself. That’s the advantage of ‘forty years.’ You can touch that with yourheart – that G-d loves you and you are one with Him. ‘That is exciting,’ I said. I was silent, absorbing my child’s wisdom. ‘Mommy, do you think I’m an incarnation?’ he asked. Do you understand where his language comes from? The forty years. That’s what reminded me of the story, this notion that G-dliness becomes real to us. Yes, the children pick it up in a different way. It’s accessible to them and they’re open to it. Look, with the heightened awareness, comes heightened pain. Some months ago as I was putting the boys to bed, Mendy turned to me and said, ‘Mommy, I don’t want Mashiach to come.’ I asked him why. But you know Rabbi Kesselman, he keeps coming back to it. Every few days or weeks, he brings up this notion of ‘forever’ and wonders how to justify it. I understand Mendy all too well. This wave that’s flooded the world, I pick up on it. Sometimes it just manifests as a leitmotif. And sometimes the existential question courses through me. I’m eating, or praying, learning…anything. And the question is there – what justifies a life? What can I possibly do to justify this moment? When Mendy said, ‘Forever is so boring,’ I felt my tummy turn – like going over the top of a rollercoaster. What can you fill forever with if a moment is too long to invest with meaning? I guess what I’m saying is that this apprehension of G-dliness is a blessing that takes me beyond myself. But it can also be a curse. How do we determine whether the revelation leads to madness and negativity or to robust life and sanctity? It depends on how you go in to the awareness. That’s the story of Rabbi Akiva and the sages. Four went in to the orchard of consciousness and only he came out sound. Why? He entered in peace and so he left in peace. On 28 Nissan when the Rebbe addressed the Jewish people and said, ‘I’ve done all I can. Everything I did until now is for nought,’ he was addressing the same thing: what could possibly justify a life. But from that question, came the most intense years of giving and inspiration and working towards the coming of Mashiach. He went in to the deepest existential space from a place of peace and so only light was born of that darkest question. Why am I still married? What justifies a life? Why am I still alive? It’s all the same question. You don’t see how you’ve grown. All of us, we’re lacking and missing and poor. But we’re richer than any generation that ever lived! All of this is why it’s so important to learn from someone who fears Heaven. Someone who’s ego is backstage. That’s the teacher who can give you what’s between the lines. Then you can change. And with that, you can help others change. Each of us is responsible for our own service and standing. But it’s easier to help a person who recognizes G-dliness. The morning prayer service ends with the words, ‘And I will save you.’ You know from what? G-d tells us, ‘I’ll save you from yourself!’ ‘Forty years’ will save us from ourselves. And when you ask, ‘What justifies a life,’ after your ‘big apprehensions’ and leap into the cosmic wave of ultimate meaning, after all that – remember that there is something even bigger. Walk with the teaching of the Baal Shem Tov. A soul can descend to this world and endure all its darkness and questions for one reason only. To do a favor for another. When the wave of ‘forty years’ brings you to shore, stand up and do a favor to another.